Humans, like all vertebrates, have a closed cardiovascular system where blood circulates under pressure. To maintain the integrity of this system in the case of injuries, vertebrates have developed a complex blood clotting mechanism capable of closing wounds. Without such a capability, humans would literally bleed to death from even a small paper cut. Although blood clotting is an important part of our physiology, the occurrence and the extent of this process has to be accurately controlled. Too much clotting interferes with blood flow and can lead to serious medical conditions like stroke, heart attack and venous thrombosis, a common condition where a blood clot forms within a vein. 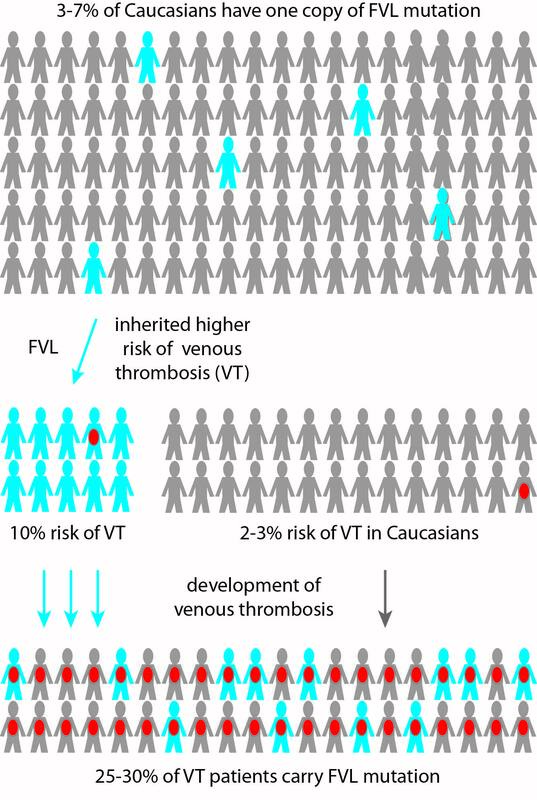 Individuals carrying Factor V Leiden (FVL) mutation have higher lifelong risk to develop Venous Thrombosis (VT) (10%). Over all VT patients, 25-30% have the FVL mutation. Venous thrombosis (VT) is the cause of major health problems in western societies. Every year in the United States, it affects 1 in every thousand individuals and is responsible for around 300,000 hospital admissions. Venous thrombosis is a complex disease, primarily because it is determined by both our genetic makeup (60%) but also our environment and lifestyle (40%). One gene mutation associated with venous thrombosis is called Factor V Leiden (FVL). 25-30% of those who suffer venous thrombosis carry the gene and 3-7% of Europeans who carry the mutation, have a 10% risk of developing venous thrombosis in their lifetime. Clearly, there are other genes influencing the development of venous thrombosis, and, understanding which genes is critical to prevention and improved treatment. Despite recent efforts, most of the genes that contribute to venous thrombosis risk are still unknown. The complexity of the disease, along with highly variable populations and living environments has made it difficult for the critical genes to be identified. 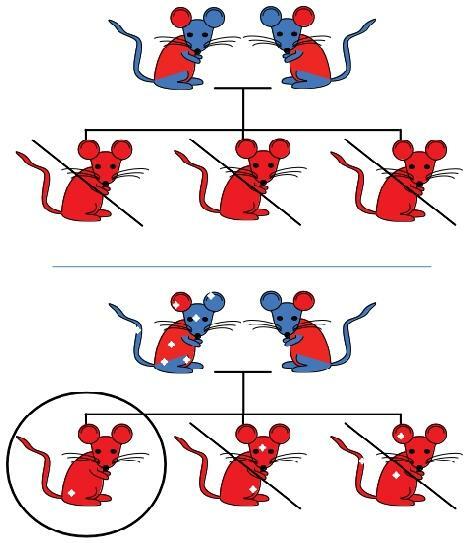 While each human has a unique and complex genetic make-up, mice all have identical genetics (just like identical twins) and so it is simpler for us to study mice to understand gene mutations. The control of the delicate balance between clotting and bleeding is achieved by multiple factors in our body, which we can broadly categorize into two groups: pro-clotting and pro-bleeding. These factors are in constant dialogue to allow for efficient clotting, but only in specific regions and when needed. In a healthy individual these factors are in perfect balance. If this balance is severely disrupted by a mutation in one of the factors, it will result in either extensive bleeding or clotting. All mice carrying the severe clotting gene-set die at an early age, but random mutations that are introduced can re-balance the clotting system and result in healthy mice. Although mutations in either pro-bleeding or pro-clotting factors alone may lead to severe disorders, having two of these mutations simultaneously can balance out the detrimental effects and result in a healthy individual. In other words, one mutation could ‘rescue’ the other from the disease. This ‘rescue’ phenomenon can be applied to screen for unknown clotting genes using a mouse with a disturbed bleeding-clotting balance due to a known mutation. For example, there are mice with the same mutation in the FVL gene that is also present in humans. The offspring of these mice, that have an inherited mutation in another clotting gene, suffer extensive blood clotting and die at birth – as illustrated by the crossed out red mice in the inset figure. In these mice the bleeding-clotting scale is heavily tilted towards clotting. The idea of screening is to go through thousands of chemically introduced random mutations (illustrated by the white diamonds in the inset figure) in all genes in order to find the ones capable of re-balancing the scale in that mouse model. Only a mutation in a factor on the opposite side of the scales is expected to have an effect. Other mutations will either have no effect on the bleeding-clotting balance, or will make the condition worse. As the mice with severe clotting are expected to die at an early age, the presence of survivors is taken to indicate the presence of a balancing gene. Survivors, or ‘rescued’ mice, are expected to carry a mutation in a gene that plays a role in controlling blood clotting. In our laboratory, we have identified multiple such survivors, each with a different mutation. While individual mutations can severely affect the balance between bleeding and clotting, the occurrence of mutations with opposing effects can have the effect of balancing each other out. Having identified ‘rescued’ mice, the next challenge is to identify where the randomly created mutation is located in their DNA. With new next-generation sequencing technologies it is now possible to search through mouse genes to find mutations and thus genes involved in rescue. Although such sequencing technologies are complex, they all rely on the identification of small pieces of DNA, followed by the reassembling of the whole DNA sequence from these small pieces using a reference sequence. All positions that differ from the reference are potential mutations. The mutations found in these studies could potentially be an important link for understanding the mechanisms of blood clotting, and could serve as a potential target for new pharmaceutical treatments. To establish such potential, many years of research lie ahead. There remain a significant number of questions to be answered before the identification of a gene can lead to the development of a drug. Scientists are currently asking what other possible biological pathways such a gene might affect, whether the function of this gene might be the same in humans as in mice, what effect the drug treatment might have in animals and whether the drug would eventually be effective in humans. Meanwhile, since many of the identified genes may not allow the development of an associated drug, it is important to identify as many potential genes as possible. One could well succeed, and if so, end up helping hundreds of thousands of venous thrombosis patients annually in the U.S.A. alone. Kärt Tomberg is a 2010 fellow of the Fulbright Science & Technology Award Program, from Estonia, and a PhD candidate in Human Genetics at the University of Michigan, Ann Arbor.